This is a USB to parallel adapter with cable which is compatible with win xp, win7, win8, win10. Works with Mach3 software via plugin. Up to 100kHz operation. Fast communication with data buffer for robust and stabile operation. Plug and Play, no driver installation is required. 100% brand new USB connection to the control PC. Same pinout as a standard LPT port. Wish you a cheerful operation with our product. -Works with Mach3 software via plugin. Up to 100kHz operation. -USB connection to the control PC. Same pinout as a standard LPT port. -Fast communication with data buffer for robust and stabile operation. -Compatible with win xp, win7, win8, win10. As an reliable seller, we promise that 100% money refund about damaged product during delivery. We are committed to provide the best customer services to our customers. If you have any questions, just contact us and we will give you the most satisfactory solution. 【 Communication with Data Buffer 】High grade USB to parallel adapter with cable. Fast communication with data buffer for robust and stabile operation, ideal for connecting USB-equipped desktop or notebook computers to a parallel equipment. 【 Fast Data Transfer 】Works with Mach3 software via plugin. Up to 100kHz operation. This is the perfect replacement for the broken one. 100% brand new, direct aftermarket parts. 【 Replaces the LPT Port 】USB connection to the control PC. Same pinout as a standard LPT port, which is a good replacement the LPT port. Such a practical tool you will need it. 【 Easy Installment 】Plug and Play, no driver installation is required, no external power adapter needed, so that it is direct and quick for easy installation and indications, warm welcomed. 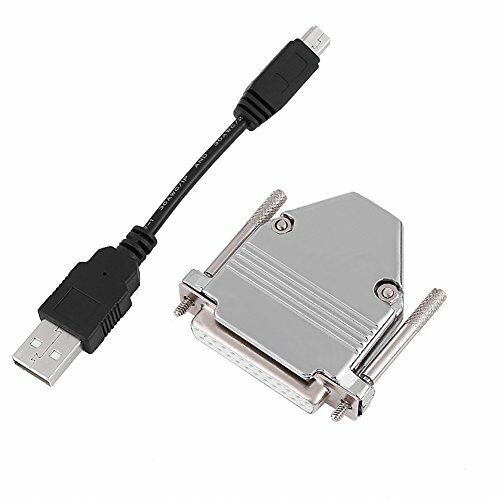 【 Wide Compatibility 】This USB to parallel adapter is compatible with win xp, win7, win8, win10. Works with Mach3 software via plugin. This is a perfect choice if you are in need of a USB to parallel adapter!